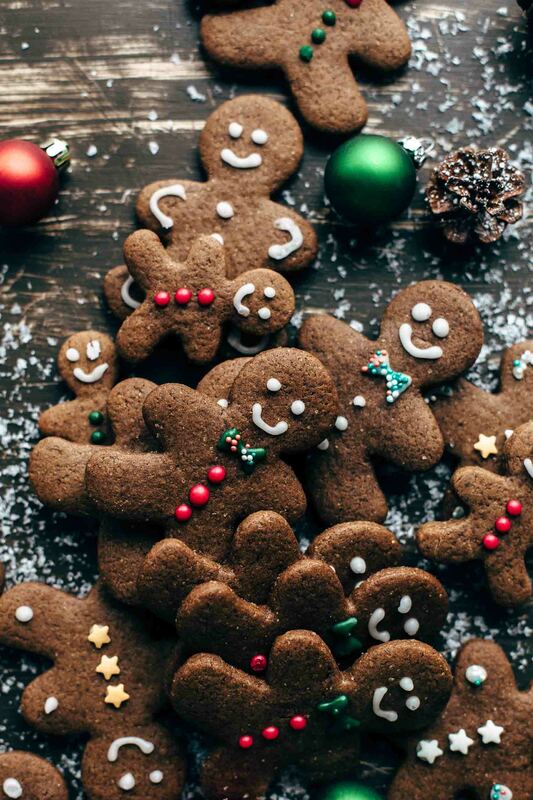 This easy Gingerbread Men Cookies recipe is a must-have for Christmas. Intense in flavors! Ginger, cinnamon, allspice, cloves, nutmeg, vanilla, and lots of molasses. 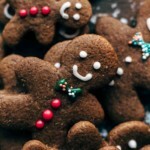 Stop looking for any other Gingerbread Men cookies recipe. You don’t need to. 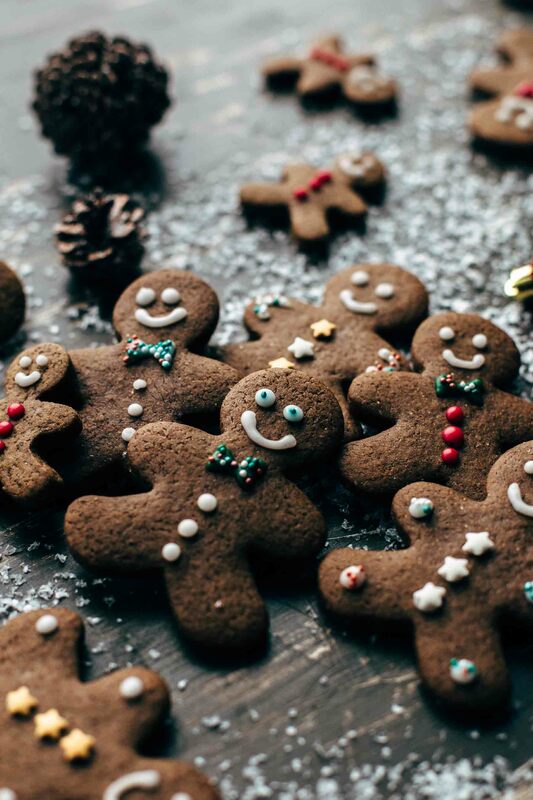 This is the one and only Gingerbread Men recipe you need. It is easy to make, and you can watch every step in the video below. Christmas is a blessed time a year. 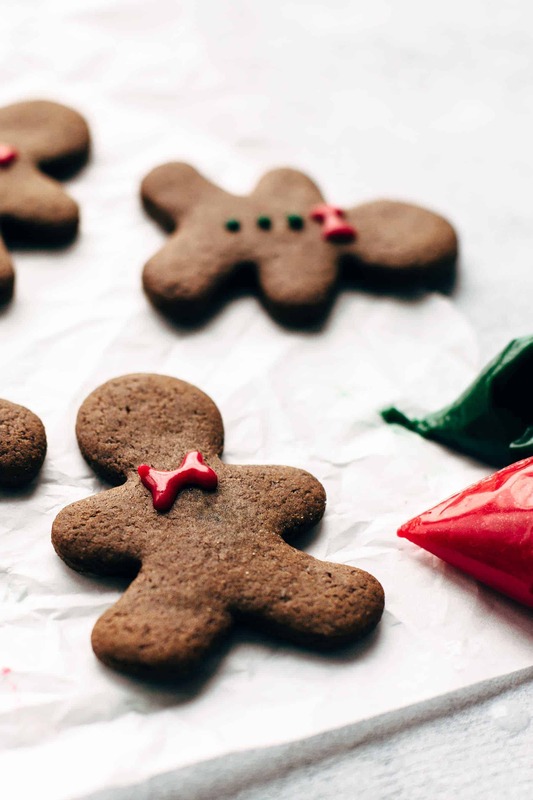 To make sure that you have a joyful season without any baking stress, I share with you a handpicked selection of my favorite Christmas recipes which are easy to make and super delicious. Recipe No.1 was my Christmas Thumbprint Cookies recipe. They literally melt in your mouth and have an intense buttery flavor. Recipe No.2 was this Easy Chocolate Rum Truffles recipe. Boozy, creamy, chocolatey. 4 ingredients. Recipe No.3 was the Best Eggnog Recipe in the world. Ultra creamy, spiked, and lots of flavors like vanilla, cinnamon, and nutmeg. I highly recommend eating these Gingerbread Men Cookies with the eggnog. Dunk them in eggnog. Addictive! As you could see in the video above, they are really easy to make. Just mix all ingredients together in the described order and knead the dough a few times in the end. No big deal. I divide the dough in half, form into discs, and wrap it up tightly. It’s way easier to roll the dough when it is divided into two halves and have a disc form. Chill the dough at least 3 hours before rolling and cutting. I chill mine overnight. You could make the dough up to 3 days in advance and store in the fridge. When you roll the dough keep it about 1/4 inch (6mm) thick. They are super soft when you keep them thicker. The next great thing about these Gingerbread Men is that they don’t spread. They keep the form as you cut them. This is great for the eye because they don’t lose their shape. After cooling, you can decorate them as desired. Dunk in chocolate, decorate with royal icing, sprinkle with sprinkles or nuts. Make them traditional, modern, funny, or whatever you are in the mood for. Spoiler alert: something great will come next week. I just say gingerbread men, eggnog, tiramisu. Stay tuned. 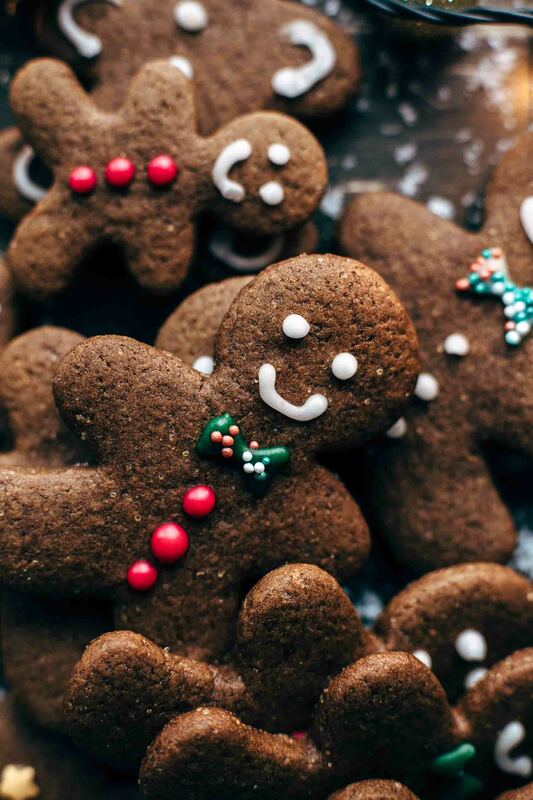 If you make this Easy Gingerbread Men Cookies recipe leave a comment, rate it and tag a photo #alsothecrumbsplease on Instagram! Would love to see your snap! Combine flour, baking powder, salt, ginger, cinnamon, allspice, cloves, and nutmeg in a large bowl. Set aside. In another bowl, mix with a handheld or stand mixer fitted with a whisk attachment butter on medium speed until creamy, for about 1-2 minutes. Add brown sugar and molasses and mix until combined. Add egg and vanilla* and mix until fully combined. Add dry ingredients and mix on low speed just until combined. The dough will be sticky and thick. Give it a few kneads by hand and divide in half. Form discs and wrap up tightly in plastic wrap. Chill for at least 3 hours or up to 3 days. Preheat oven to 350°F / 175°C. Line 3 baking sheets with parchment paper and set aside. On a well-floured surface roll out dough discs into a 1/4 inch thickness. 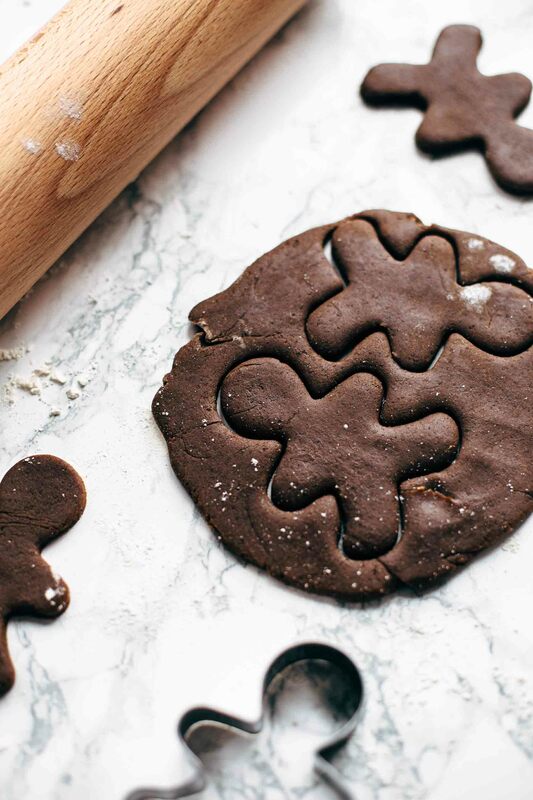 Cut out cookies with a 4-inch gingerbread men cookie cutter and place on the prepared baking sheets with about 1-inch space in-between. Bake for 8-9 minutes. I baked mine for 8 minutes. I also made 2-inch cookies which I baked for 5 minutes and 6-inch cookies for 11 minutes. Allow cooling on baking sheet for 5 minutes then transfer to cooling rack to cool completely. Store in an airtight container at room temperature up to 1 week. OPTIONAL: Stir together sugar, water, and salt until combined. Spoon into a zip-lock bag and cut off a little piece of one edge. Pipe on cooled cookies as desired.